San Sebastian is a beautiful beach town in the Basque country of northern Spain. Known for its aristocratic lineage it reflects a rich sense of Basque history and culture. There are three main areas of the city which include – The Parte Vieja a.k.a Old Town in Monte Urgull, Cathedral and the Gros (named after a French general). San Sebastian is all about relaxing on the beach, wandering the ruins of old palaces and delving into the tingling culinary variety of pintxos and tapas. Those who love great wine and food, don’t have to look further than Rioja, one of Spain’s most picturesque regions. Events taking place around the city include bullfights, parades, food events and more. San Sebastian, one of the most diverse cities of Southern Europe, is reputed for its culinary experience. Surrounded by mountains and flaunting its beautiful coastal location, it offers breathtaking scenery with Basque charm. Here, enlisted are some of the top places to visit in the enchanting Donostia area. This building was designed by the British architect Seldon Wornum in a classic English cottage style with a fantastic open view over the bay. This historic beauty of 1893 is bordered by gardens to serve as the perfect summer holiday home for the royal bloods. This historic building is worth venturing between the city centre and the Antiguo neighborhood to wander around the picturesque landscape views over the La Concha. The Ayuntamiento is located between La Concha Beach and the old city alongside the beautiful Alderdi Eder Gardens. This amazing city hall was constructed between 1882 and 1887 and is an epitome of architectural invention. The building set the scene for one of the many fights between nationalists and republicans in the Spanish Civil War, where the bullet holes can still be seen in the façade. A large portion of San Sebastian international foodie fame is credited to pintxo. Traditional pintxos consist of baguette bread topped with almost any kind of food and held in place with a toothpick. They are basically another version of tapas. It is very common to see pintxos laid out in bulk in front of the bar, allowing customers to choose to their liking. Pintxos in San Sebastian have significantly evolved over time but bars don’t always adhere to the traditional bread or skewer base when serving them. Zeruko offers a great deal of variety in what they serve. They lay the contents of its txitxarro dish (cheese, mint, chopped fish and milk) on top of strawberry wafer. Places like La cuchara de San Telmo offer suckling Sevogian pig or veal cheek, one of the most ordered dish of Spain. Another specialty of San Sebastian that you definitely dont want to miss is the savory spider crab tartlets. There are pintxos bars all over San Sebastian but it’s always better to start your culinary tour from Parte Vieja. There are, in fact, organized pintxos food tours organized by Viator, San Sebastian PintxosTours and Intrepid Urban Adventures. Everyone is born into their country as an accident of birth or fate. But when one travels, one suddenly feels a kinship with a country which may develop into real love. 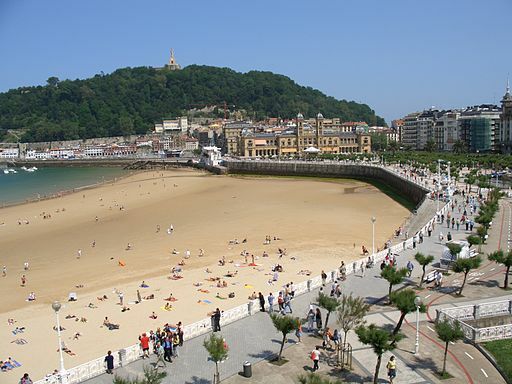 San Sebastian is known for its legendary towns, excellent cuisines and beautiful beaches. Not to miss the molecular flavor and textures of the ultimate pinxtos. If you are a party animal who loves to hike, eat and wander dreamy places, San Sebastian is the place for you. About The Author: Yogi and Suchna believe in taking the road less travelled and stumbling upon some hidden gems along the way! For over a decade, they’ve mapped their way across various continents, sniffed out unusual routes, discovered new flavours and stayed at quirky hostels. TheVillaEscape is their expression of soul travel. To check Norway Northern Lights Tour you can catch up with them at TheVillaEscape.